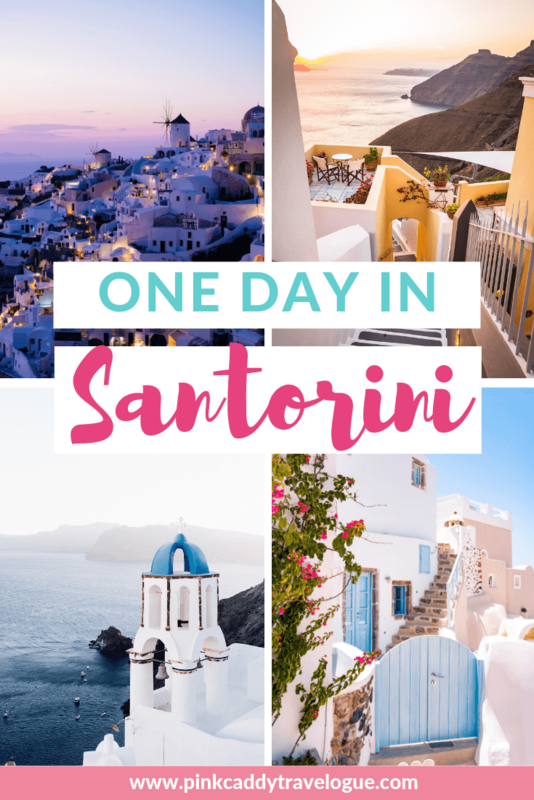 Only get to spend one day in Santorini? This is the itinerary for you! Santorini: every Instagrammer’s favorite Greek island. 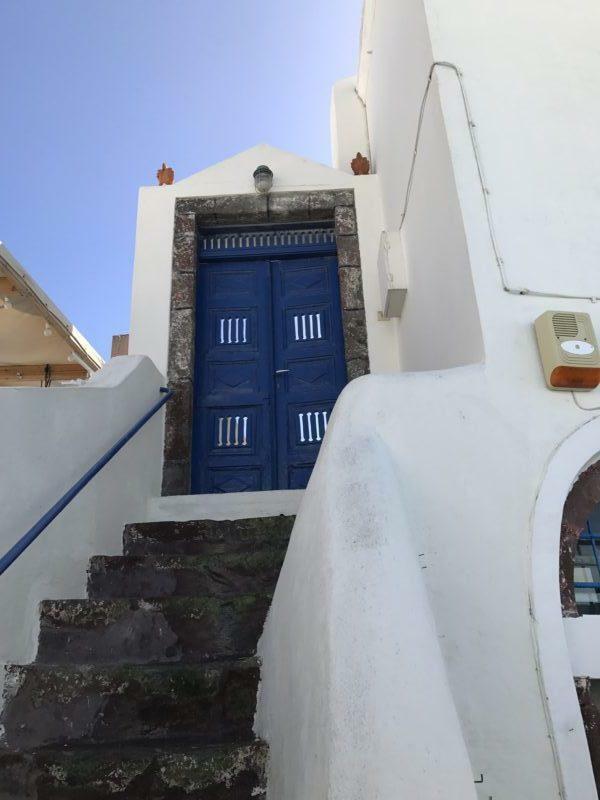 And it’s not hard to see why, what with its aesthetic villages of snow-white abodes, accented with cobalt blue roofs, doors, and garden gates, and immense sheer cliffs reaching down into the Aegean. It truly is picturesque no matter where you look. 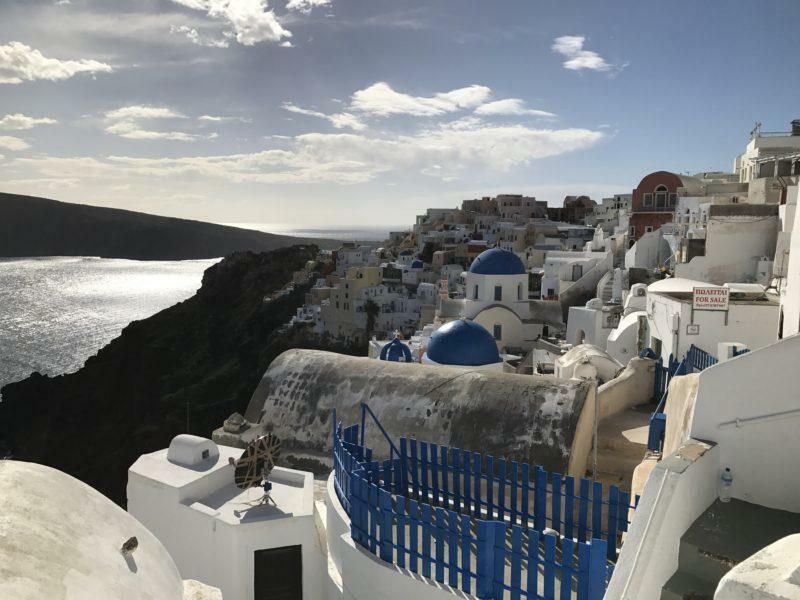 As popular as it is, you may think that Santorini is inaccessible to you or any other average Joe (no offense to Joes), whether because of its status as a luxury island or the very fact that it’s an island in the middle of the sea. But it actually makes the perfect day trip from Athens! 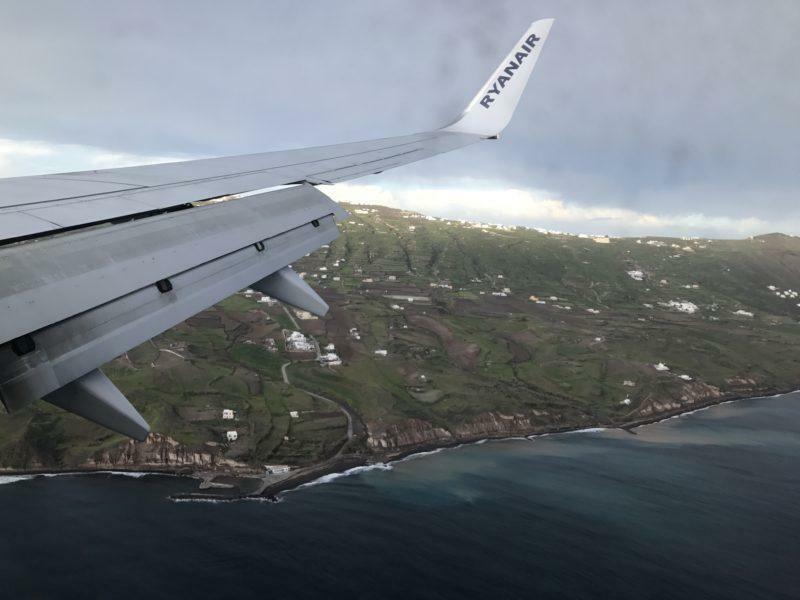 Round-trip tickets on Ryanair from Athens to Santorini are only 30 euros in the off-season. And with the flight being a mere 45 minutes, it’s just as quick to get to as any of the mainland sites outside of Athens. 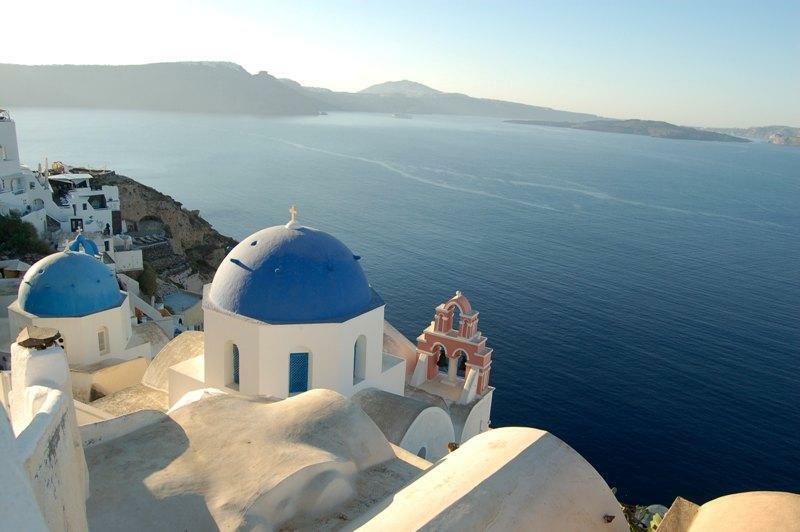 Unlike other top-destinations (like Venice), spending one day in Santorini is manageable, as long as you have a plan. So to make your life easier, here’s an already made plan that has been created and tested by me that you are welcome to use! “But that’s so early!” If you want to have as much time as possible on the island, you need to take the earliest flight out of Athens. It’ll be worth it. You do only have one day in Santorini, after all. Also, brace yourself: the runway at the airport is VERY short. Our rather rough landing earned our pilot a round of applause from us passengers happy to not be currently floating in the ocean. Your first stop of the day should be the Akrotiri Archaeological Site. It’s not widely known about, but it was one of the highlights of my trip to Santorini. The ancient settlement of Akrotiri was destroyed when Santorini’s volcano erupted. But, like Pompeii, the layers of volcanic ash preserved the city. It’s a time capsule back to 4000 BC Minoan civilization. Go here for my article on how awesome this place is and why you need to go. The public buses are the best mode of transportation on Santorini if you’re only there for a day. Most of the streets are not car-friendly. ATV’s are another popular transport, but you can’t go as far and as fast as on a bus. Taxis are another option, but the bus fare is always under 3 euros, regardless of where you’re going. To get to Akrotiri from the airport, you need to take the bus to Fira (it’s easy to find, it’s the only bus option at the airport). From Fira, get off and transfer to the bus going to Akrotiri. The bus “stations” (usually just an open space with a plethora of buses) are chaotic, but most of the drivers understand English and will be able to help you get on the right bus if you get confused. Note: All times from here on out are approximate, as your schedule will be dependent on the buses. Tickets to the archaeological site alone are 12 euros. Or, you can get the combo ticket for 14 euros, which I suggest doing. If you also want to visit any of the museums on the island, the combo ticket will save you a few euros. I’m including one of them on the itinerary, so if you follow this plan, get the upgraded tickets. All admission info can be found here. You don’t need a ton of time at Akrotiri because the site is small, but it’ll be about an hour before the bus comes back. Might as well enjoy it! Look how deep the city was buried below the ash! From Akrotiri, get back on the bus and get off at Fira. FYI: Fira is also called Thira depending on what alphabet is used; you will see both names, so don’t let this confuse you, they are the same thing. But to make things more confusing, “Thera” is the ancient name of the island. You will also see that, but it’s not referring to the town of Thira/Fira. Lol. 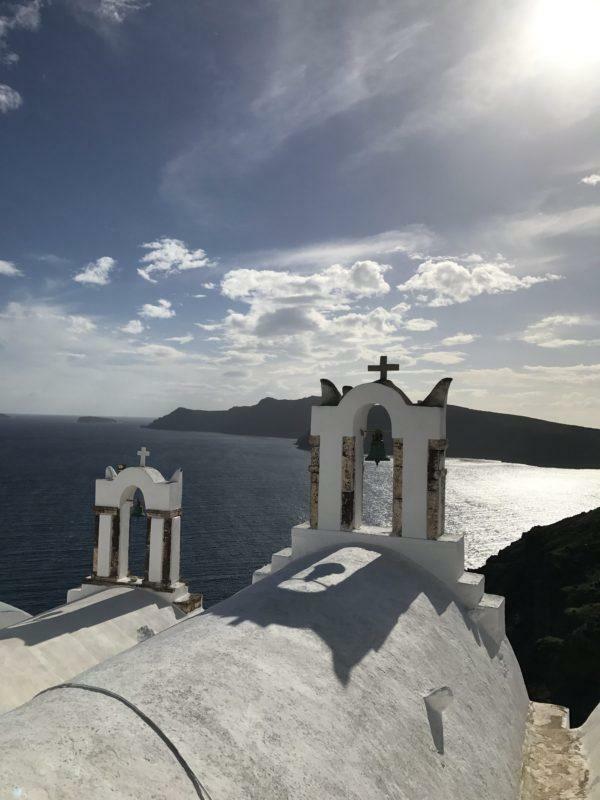 If you are here in the off-season, you don’t need much time in Fira – nothing is open until April. 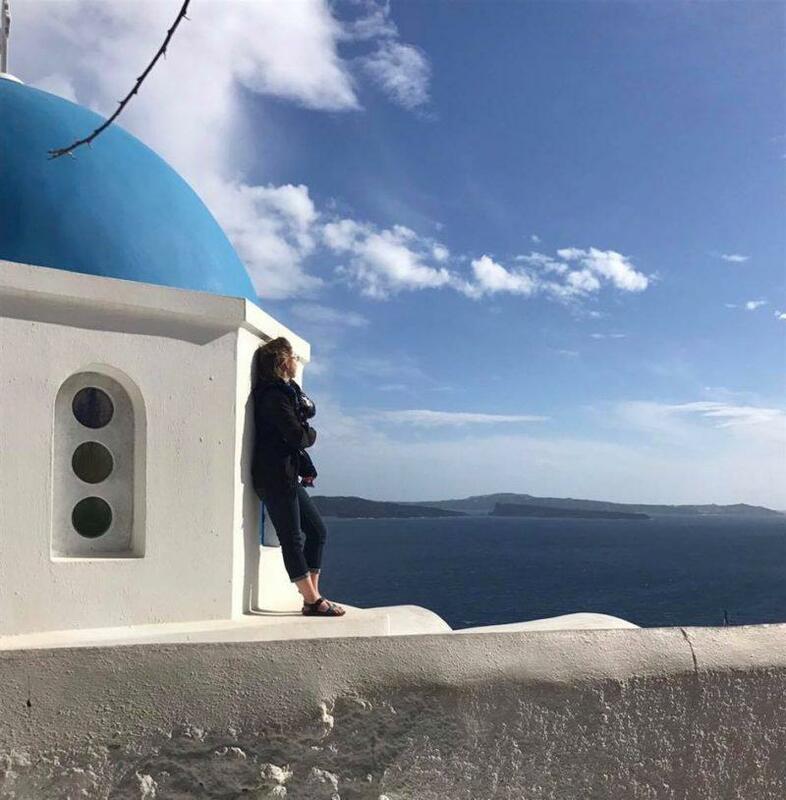 But it’s still fun to walk around the alleys and take pictures of the gorgeous view – because Fira is in the center of Santorini’s mainland, you can see both ends of the island from here! I actually recommend visiting in the off-season as opposed to coming in the summer. It will make this one day in Santorini much more doable. We were there in March and were able to get around the island pretty easily. 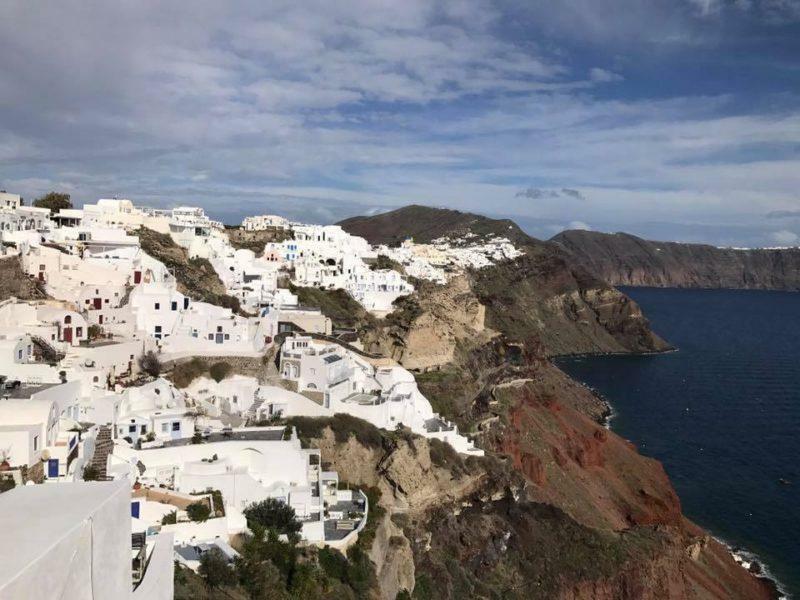 But one taxi-driver told us that the normally 20-minute drive from Fira to Oia can take 1.5 hours during the summer because of the traffic. That kind of traffic would significantly limit what you can do in a day. During the summer, the island also gets multiple cruise ships every day, which each dump thousands of visitors into the tiny streets of Fira. From what the locals told us, Santorini summers actually sound pretty miserable. Make time to visit the Museum of Prehistoric Thera (especially if you got those special combo tickets), located near the Fira bus stop. 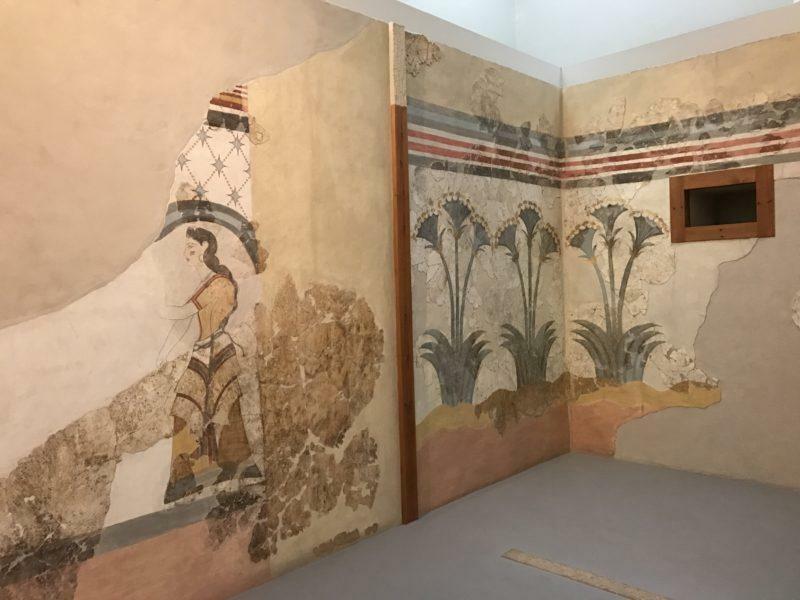 It’s small, but it houses all of the original, beautiful frescoes that were taken from the Akrotiri site. 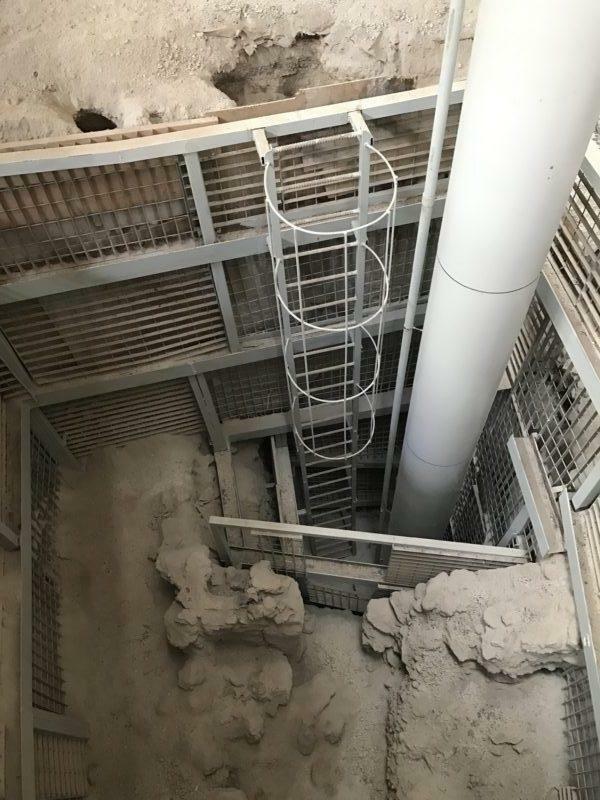 It helps provide context to your Akrotiri visit and gives you a better idea of what the site would have looked like 4000+ years ago. From Fira, catch the bus to Oia (pronounced ee-ya, though I can’t help myself and always say oy-yah). The ride is a very scenic 30 minutes that travels along the mountainous spine of Santorini to the northernmost tip of the island. You know those pictures of infinity pools hanging over the Mediterranean, or tan, bikini-clad models posing against sparkling white buildings? Yeah, those were taken in Oia. 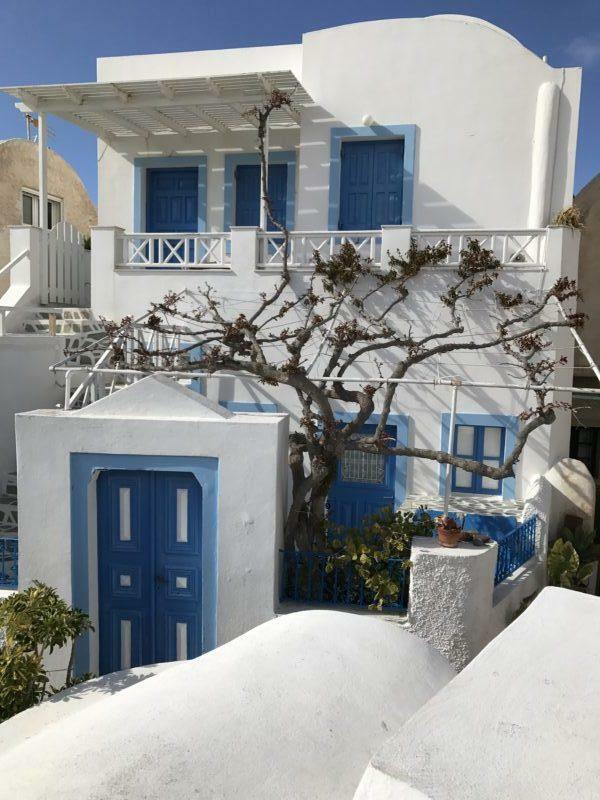 Oia is Santorini’s signature aesthetically pleasing village. This is where you will want to spend most of your time during your one day in Santorini. Like Fira, if you are here in the off-season, almost everything will be closed. But that doesn’t matter – you can spend hours wandering through the white-washed alleyways and not be bored at all. With eye candy everywhere you turn, you won’t want to leave! Food tip: When we were here in March, there was only one (ONE!!!!) restaurant open, out of the hundreds that operate here in the summer. So….keep an eye out for that one restaurant when you get hungry for lunch! Maybe you’ll be luckier, but when we went the only flight back to Athens left Santorini at 7:30 PM – which means we didn’t have a chance to see the famous “Santorini sunset.” That’s one of the drawbacks of only having one day in Santorini. The Santorini airport is tiny and only has flights in the morning and evening. That means that it closes in the afternoon and doesn’t open again until about 30 minutes before the first evening flight is scheduled to leave. So you don’t have to rush back to the airport, but you do have to remember that you will need two buses to get there: Oia to Fira, and Fira to the airport. If you just can’t bear to leave Oia before sunset, you can always get a cab to the airport. Cabs charge at least 20 euros one way, as opposed to the 3 euro bus fare. You’ll be pushing your time if you take a taxi, as there aren’t THAT many cabbies in the off-season, but just know that that’s an option! And with that, your one day in Santorini is already over! But it’s never too early to start planning your next trip back. 7:35 PM: Don’t be sad; start figuring out when you can visit Santorini again! Light jacket – it can get quite windy on the island! Comfortable shoes – you’ll be doing lots of walking, and you don’t want your feet to wear out before you’re done exploring! Have you ever been to Santorini? I thought it was worth the hype, but did you? Let me know in the comments! 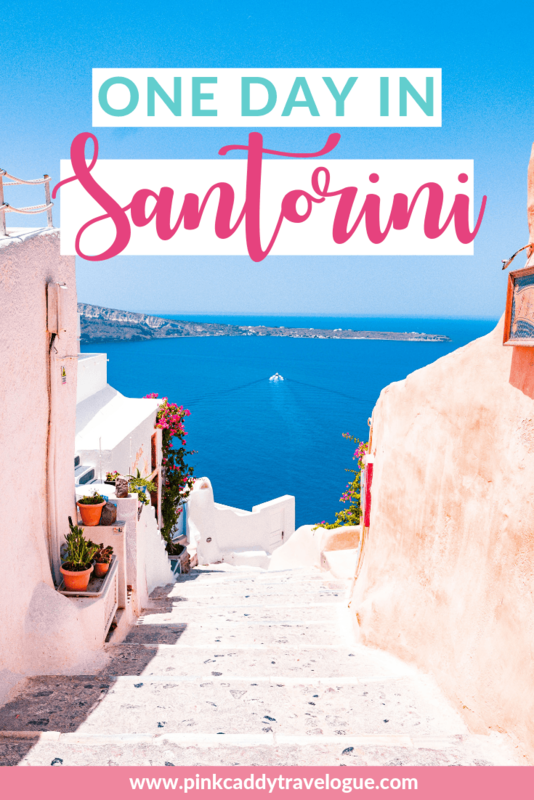 Check out this post for 14 more things to do in Santorini! This has been a bucket list item for awhile. Good to know it’s doable as a day trip. Did you find that it’s cheaper to go by plane vs. ferry/boat? A one-way ferry trip is about 90 euros (much more than a round-trip flight), and takes 5 hours, so that wasn’t even an option for us doing a day-trip. Some people really want the ferry experience though, so if you have more time it’s worth looking into. Santorini is on my bucket list. I want to take pictures of it all, especially Oia. I’ve heard they have the best sunsets. I find it crazy that nothing is open till April, that would make finding food a little more difficult, but it is nice to know Santorini can be done in a day! Wow! What a whirlwind trip! I would be so nervous about flying in and out in one day! Heading to Santorini for 10 days in May. Thanks for the tips. Can’t wait. Santorini is definitely on my travel bucket list!! It looks so beautiful! I love Santorini! I went there on a failed honeymoon and returned for a much better girl’s trip. I totally agree that their buses are the best mode of transport- those roads are way too close to the edge for me to even consider driving a motorbike or car! If you have the time, visiting ancient Fira (Thera) on the mountain top above Kamari is worth the view too. Thank you for sharing this- love those photos! Next time I go, I’ll have to check out ancient Fira! Sounds fascinating!! I agree with you, it’s worth getting up early sometimes to make the most of one’s opportunities to enjoy! Santorini looks definitely worth it, one of the most iconic places in the world. I’ve not seen so many photos of Akrotiri, and would definitely like to explore that alongside the whitewashed buildings of Fira and then Oia for those classic shots! 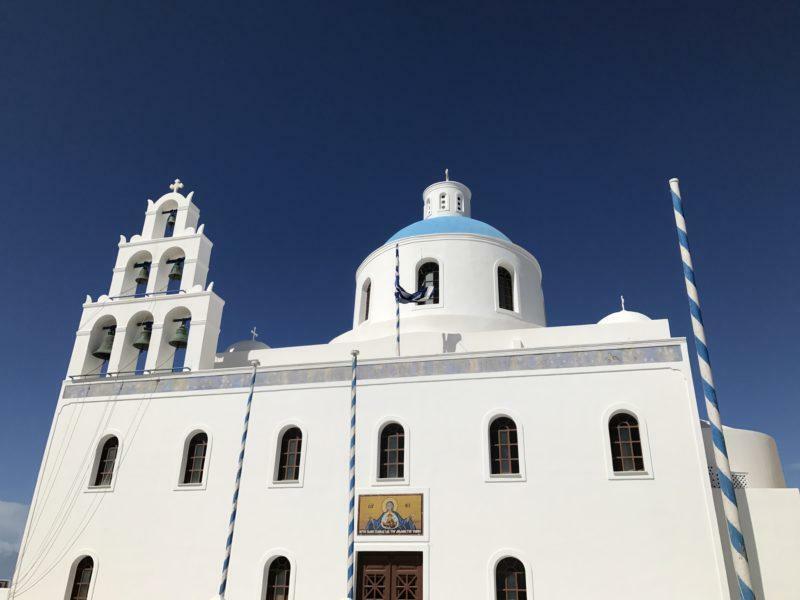 A day trip to Santorini – this is really a short trip. But you have seen a lot. I think I would rather stay longer on the island and discover it in peace. Beautiful photos! I think I would want to go for a longer period of time, but glad you enjoyed your short time there! Akrotiri especially intrigues me. Thank you for the walk down memory lane. 😉 We sailed into Santorini on a sail, bike and hike adventure a number of years ago and loved it. Dinner watching the sunset was a highlight. As was waking up early in the morning and walking along the spine of the island, when the island and its narrow streets were quiet. 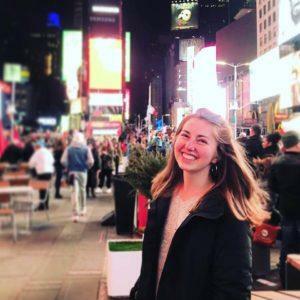 A “sail, hike, and bike” trip?! That sounds amazing!! You’re right about Santorini and Instagram, I keep on seeing it on my feed! But I can’t believe it can be that cheap if you plan it well in advance and maybe off the peak season. We’ll have to think about it! So Santorini is made up of 3 places: Anrotiri, First, and Oia! Good to know! Thanks! Thanks for the comment, i’m actually going to Greece by the end of the week so your guide will come in handy ! Great!! Have a WONDERFUL time!! 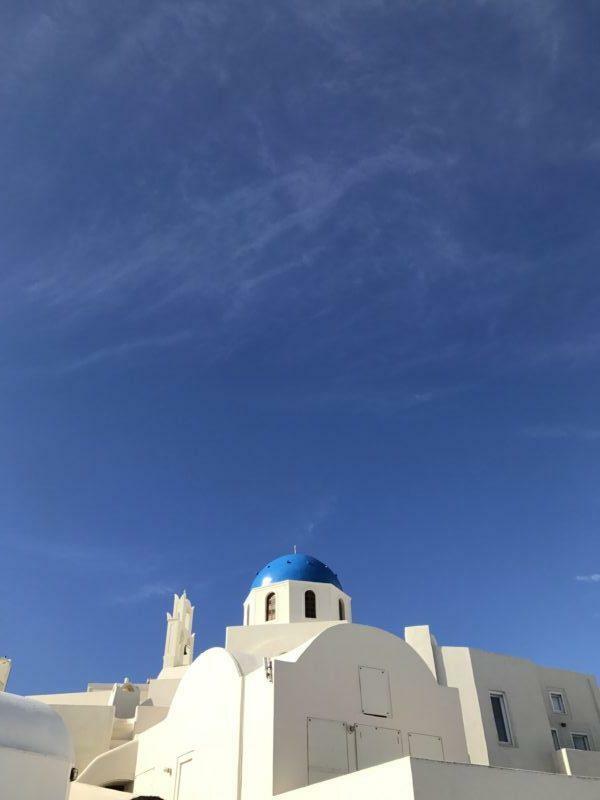 You managed to explore Santorini and nearby places in a day. Would you have liked to stay on for a couple of more days and luxuriate in the ‘Santorini blues’? I would personally prefer to stay. If I could, I would definitely stay longer than a day. In fact, I hope to eventually go back and do just that! But that wasn’t an option on this trip, so we made the most of the few hours we had! Santorini must indeed be a place that is the stuff of dreams. Of course, the white buildings and infinity pools and the mediterranean sea are now iconic, thanks to Instagram and other social media. 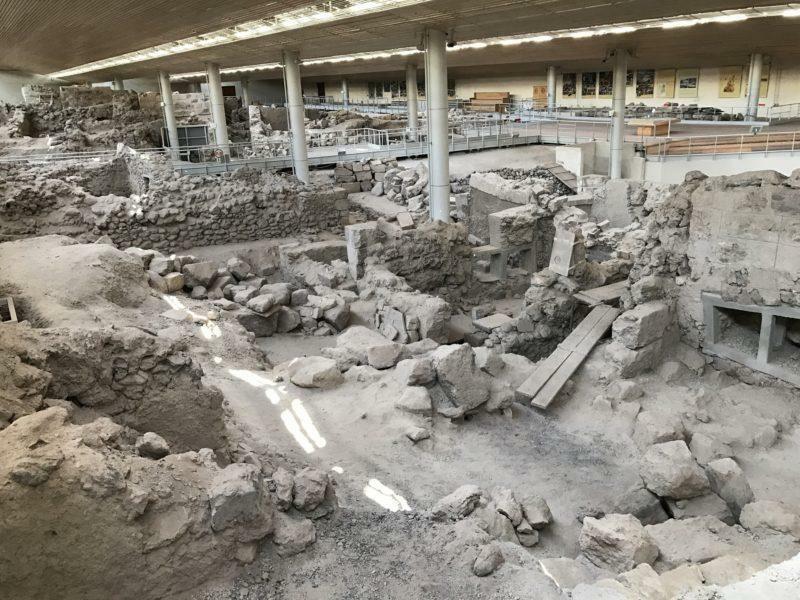 But apart from this, I am fascinated with Akrotiri Archaeological Site, it is amazing that a city that dates back to 4000 BC is so well preserved. 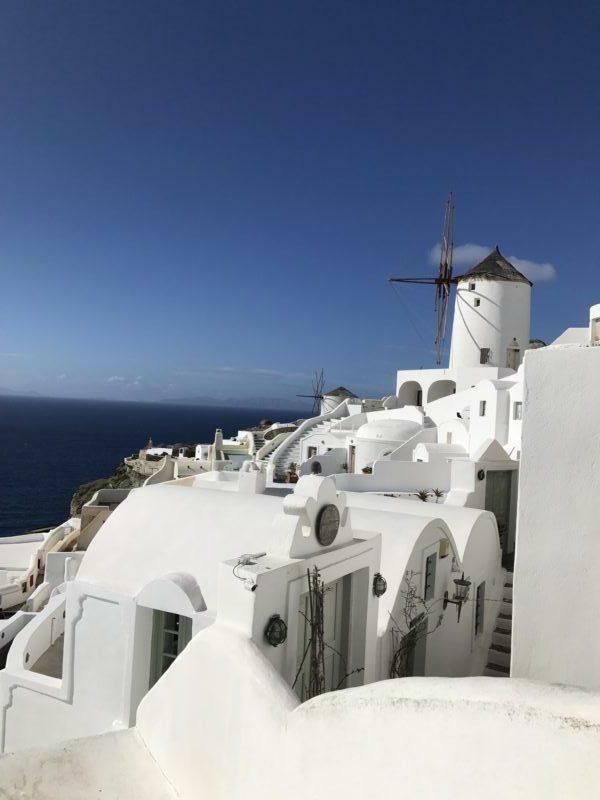 Santorini was my first stop on my first trip abroad! It’s the place that ignited my love for travel. This piece just brought back all of those amazing feelings! I went to Santorini 30 years ago and it doesn’t look like anything has changed. Except, we backpacked and it was affordable to do that. I didn’t know it is considered a luxury spot now. I guess it is so beautiful and unique, it isn’t surprising. Your recommendations were great. We rented mopeds and explored the island. We loved that. Santorini is just beautiful. Happy that one could take a perfect day trip from Athens and would prefer to visit in off season too and I so hope to not miss that only one restaurant which would be open.. haha. The “Greek Maybe Time” is funny and I quite like it. 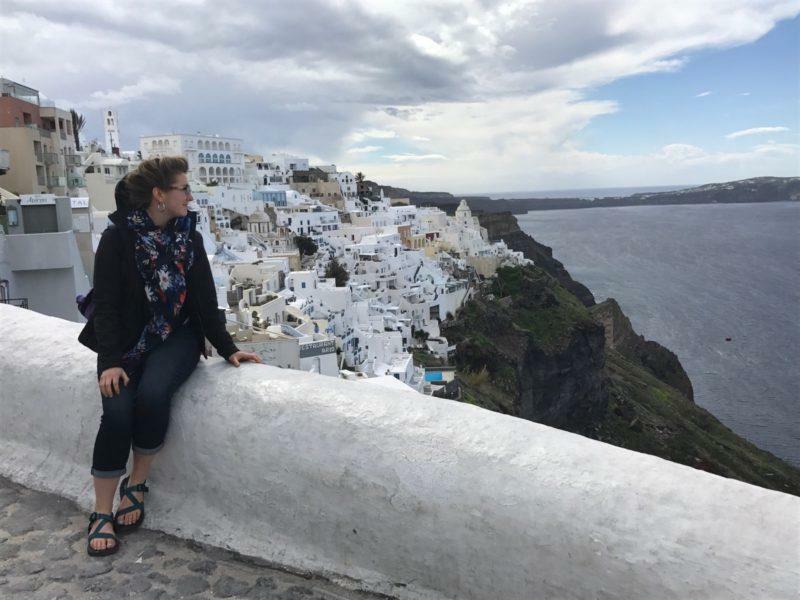 I would love to spend more time exploring Fira and Oia, just looking at the scenery around and waters, listening to the tip around traffic. Did not know about the official color called Santorini Blue. Something new to learn everyday. Never miss the latest articles and travel tips. Get them delivered straight to your inbox instead!